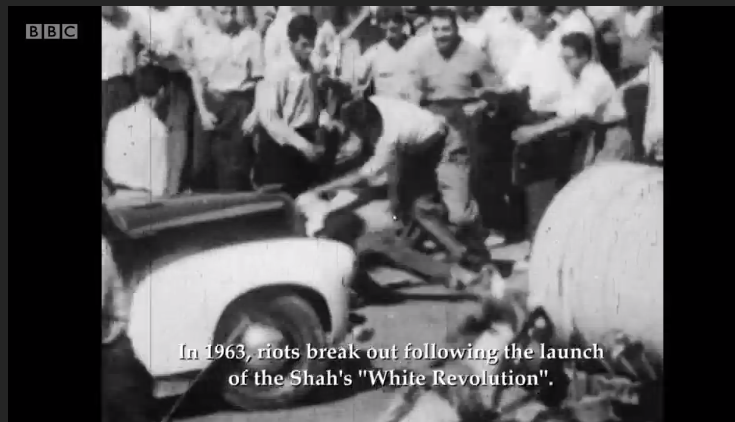 USSR's infamous security agency, the KGB, were known for their mastery in spreading disinformation, but BBC4's version of the Shah's 2500 year celebrations ceremony of Iranian history, was definitely vintage KGB disinformation. Just as in any successful KGB disinformation campaign, you need to spread a myth by telling lots of half truths first, i.e. tell part of the story but not the whole story in order to mislead the public opinion stealthily. The objective of the so called documentary was simple, viewers should conclude that the people of Iran were starving, yet the Shah of Iran had rather spend a fortune on a lavish banquet than feed his own people! Pivotal to building such disinformation is of course to induce in the mind of the viewer a wild exaggeration of the cost of the celebrations. In order to answer such vital question, the BBC conveniently doesn't ask the project manager of the event, Abdolreza Ansari, about the costs, even though he was available and is featured in the same documentary. Instead a figure of $650 Million is dished out, by the first president of the Islamic Republic, Bani-Sadr, who was toppled half way through his presidency and now lives in exile in Paris. How could Bani-Sadr have known what the cost of the celebrations came to? He had nothing to do with the organisation of the ceremonies. He was not even in Iran at the time, but plotting to overthrow the Shah with the help of Syria's dictator, Hafiz Assad. Fortunately, the project manager of the 2500 year spectacular celebrations of Iran's history has been on the record in the past and has stated the cost of the ceremonies, both in an interview with Cyrus Kadivar and in a much more balanced documentary aired on Manoto TV. The total cost of the celebrations was in fact $22 Million! "One third of the money was raised by Iranian industrialists to pay for all the festivities. Another third was from the budget of the Ministry of Court and went to pay for the Tent City. The rest of the money came from the original budget under Senator Amir Homayoun which he had invested in 1960 and was spent on the building of the Shahyad tower" - Interview with Abdolreza Ansari by Cyrus Kadivar. 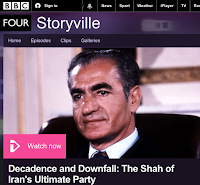 BBC4's Storyville also conveniently forgets to make any comparisons with other celebrations, such as the French government's $200 million celebration of the 200th anniversary of the fall of the Bastille or perhaps more suitably with what has been spent by the Islamic Republic of Iran on Ayatollah Khomeini's mausoleum, the most opulent mausoleum in the world! Of course there were people living in poverty in Iran when the 2500 year celebrations ceremony was taking place, just like there were people living in abject poverty in France during the 200th anniversary of the fall of Bastille celebrations and just like between 44.5 - 55% of Iran's urban population alone, according to a recent report titled 'Measurement and Economic Analysis of Urban Poverty', lives below the poverty line in the Islamic Republic of Iran today. But the BBC won't make a documentary on the most costly and opulent mausoleum in the world for Ayatollah Khomeini while there is so much growing poverty in Iran. After all, that may displease the Islamic Republic authorities, the consequences of which could be the closure of the BBC offices in Iran! Had the Shah spent the $22 Million cost of the celebrations on feeding the poor people, would that have improved the under-developed parts of Iran? Instead the Shah used the money to promote a magical country steeped in history to the rest of the world. The ceremonies showed the rest of the world Iran's growing confidence in itself and a country with a stable foreign policy of co-existence with the rest of the world which was able to gather heads of states from all around the world. Would this not have brought about more investment, more trade and improved the living standards of the Iranians? As the English proverb says "Give a man a fish and you feed him for a day, teach him how to fish and you feed him for a lifetime". Throughout the documentary there are more truths that are conveniently not told. The program director for example, Hassan Amini, himself is the grandson of a former Prime Minister of the Shah, Ali Amini. Actually this is mentioned in Persian by the Shah's former ambassador to Washington, Ardeshir Zahedi, where he points out the responsibility for the Shah's failures should rest on his officials too, "like your grandfather, the former Prime Minister" Zahedi tells the documentary's director, however this part is conveniently not translated in the subtitles. Prime Minister Ali Amini, the grand father of the documentary's director, was another one of Qajar dynasty descendants who prospered under the Pahlavi rule. The Turkic Qajar dynasty who ruled Iran for 140 years, were the most incompetent and the most decadent dynasty throughout Iran's 2500 year history. One incompetent Qajar King after another, led the demise of the Persian empire and reduced it to a poor backward country, a vassal of British and Tsarist Russian empires. Throughout Iran's history every time a new dynasty took over, the members of the previous dynasty were mercilessly massacred by the new kings on the block. The Pahlavis, the first Persian dynasty to rule Iran since the Arab invasion 1400 years earlier, with the exception of a few scattered local dynasties, were the only dynasty in the Iranian history who were magnanimous towards the previous ancien régime clan members. Most of the Qajar offsprings and princes, and there were many for they had huge hareems, prospered under the Pahlavi rule and they became important officials in the new era of modernisation, like the documentary director's grandfather, Prime Minister Amini. Yet the treachery of the Qajar offsprings to Iran has never ceased. It seems they carry a gene of betrayal in their DNA. The viewer is also not told the entire truth about who the dissidents featured in the documentary are. For example Abdolkarim Lahiji is the man who wrote the first draft of the Islamic Republic's constitution that has put Iran under the total dictatorship of the Supreme Leader. At one point the subtitle under Lahiji reads "You are leading us to hell!" Of course Lahiji was referring to the Shah holding the celebrations ceremony but I leave it to the reader to decide what "led us to hell"? the 2500 year celebrations of Iranian history or the constitution of the Islamic Republic? "Arshin Adib-Moghaddam, an Unlikely Non-partisan Analyst"
Khomeini's opposition to the abolition of the feudal system, a major cause of poverty in Iran, and the women's rights to vote, the rights of the religious minorities and other progressive reforms of the Shah are not fully and properly explained to the viewers either. 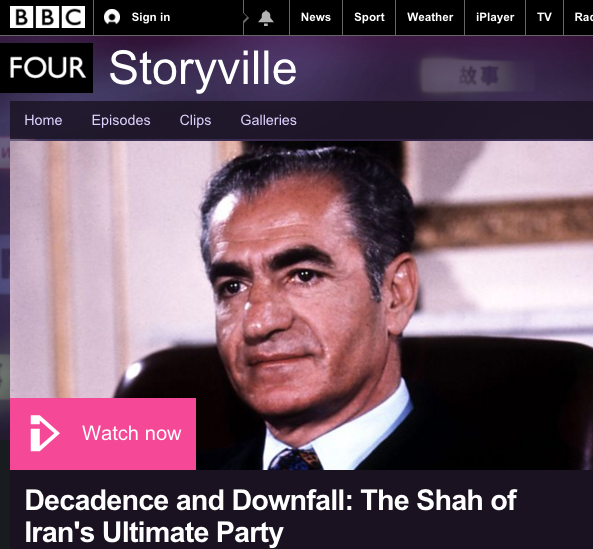 The idea after all is that the Shah was a tyrant and Khomeini was the liberator of the Iranian people or so the BBC would have the viewers believe. The list of half truths and not telling the whole truths continue in this BBC disinformation-mentary and it can be a good text book example of non-objective media reporting. At the end, all I can say to the BBC is, we were proud of the 2500 year celebrations ceremony of our history and we were more than happy to flaunt it, so get over it BBC and worry about keeping your office in Tehran! Thank you for sharing the real facts about this 'documentary'! It is a real shame that the BBC can tell such lies after all of these years, but now the people have a voice through the internet and they can respond with the facts. UCL's Marxist Lecturer on BBC Persian! Press TV or PressForSex TV?